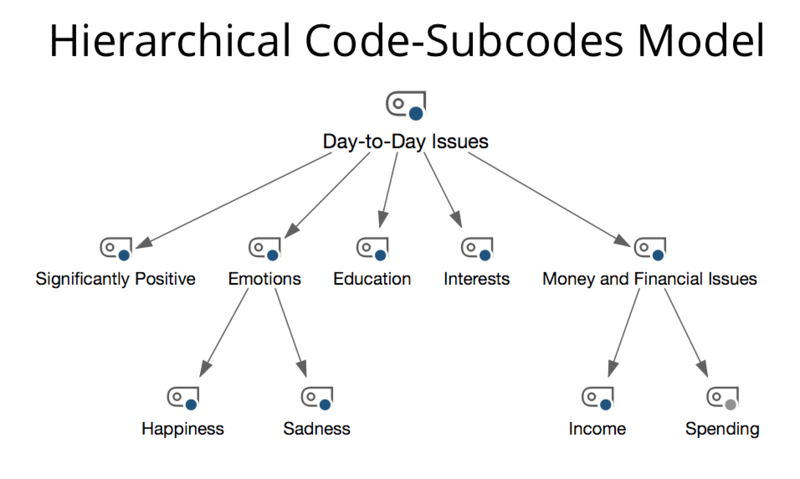 The Code-Subcodes Model is useful for illustrating the hierarchical structure of a code and its subcodes in combination with the code frequencies. The icon for the selected code is placed directly under the heading of the model. Underneath the, the direct subcodes are placed at a small distance, and a row underneath them the subcodes of the subcodes, etc. Arrows point from each code to its subcodes. Codes with many coded segments can be displayed larger than codes with few coded segments. Display codes as – The symbols can be displayed as circles or as code symbols in the map. The display of the codes can be subsequently changed via the Properties window. Size … number of coded segments – Select this option to make codes with many coded segments larger than codes with few segments. MAXMap uses three different sizes for this style of code representation: codes whose frequencies are in the range of one standard deviation around the mean are displayed in a medium size. Codes with more or less coded segments receive a larger or smaller symbol. If the code frequencies are close together, MAXMaps uses only the smallest or smallest together with the average symbol size. As a rule, the Aggregate frequencies for parent codes option will be enabled so that the frequencies of the subcodes are taken into account when determining the size of the codes above. Otherwise, it may be that the subcodes are displayed much larger than their top codes, because the top codes were used very rarely or not at all. Display activated only – Only the codes from the code system that are currently activated are considered. 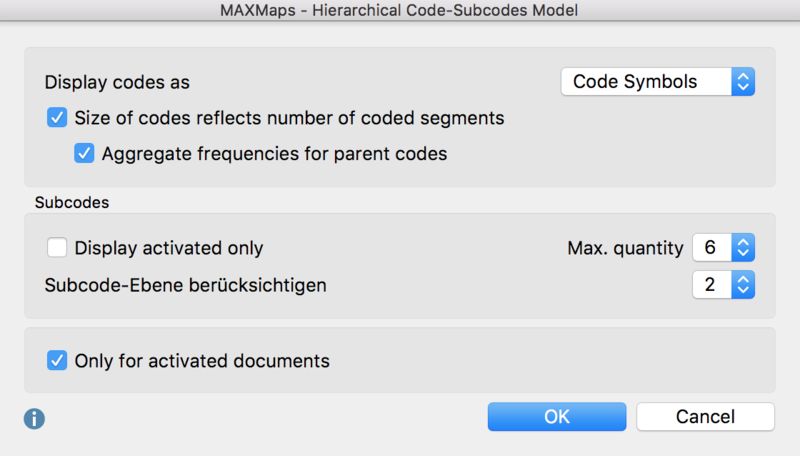 Integrate subcode level (1, 2 or 3) – Here you can set how many hierarchical levels of the code system should be taken into account. 1 means: Only the top-level codes should be included; 2 means: their subcodes should also be displayed. Only for activated documents – When creating the model and determining the code sizes, the selected option only takes into account currently activated documents.